Stay comfortably with your family or as a business traveller with the perfect location for Legoland and the sights in Kolding. We offer a large conference department, 200 free parking spaces and we are located close the motorway E45, with easy access. If you are looking for a hotel with a good atmosphere, suitable for any need, then our hotel in Kolding is worth a visit. From the moment you enter, you can experience a bright and spacious lobby with cosy nooks. Work out in our gym and pamper yourself afterwards with a trip to the sauna. Enjoy a pleasant dinner in Restaurant Gefion, round off the evening in our bar and get a good night’s sleep in our comfortable rooms, which are designed in a Scandinavian style. 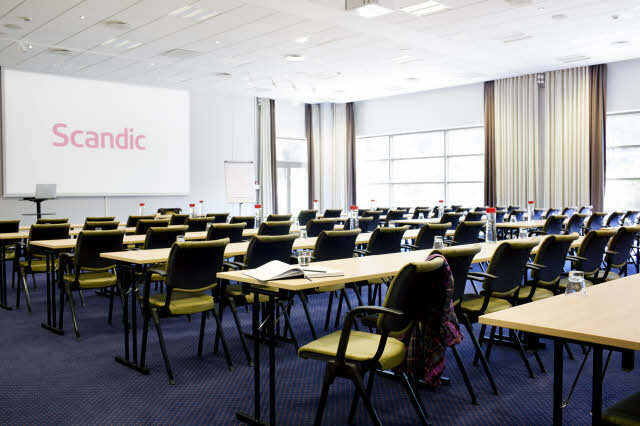 At hotel Scandic Kolding, we also have a large conference department with 18 flexible meeting rooms that can accommodate up to 600 people. If you are looking for meeting facilities where creativity and productivity are all-important, we can offer our meeting room “Think Tank”. The hotel is among our most family-friendly hotels and therefore designed well for those of you who are travelling for leisure and with children. Here your stay will become one big adventure. We have activities for big and small children with nice playrooms where they can watch films, play computer games, draw, read and have a good time. The icing on the cake is that the entire family can relax and rest in our spacious family rooms (up to 24 sqm). Transport to and from our hotel in Kolding is no problem. Our hotel is just 6 km from Kolding town centre and it is easy to take a taxi from either Billund Airport or Kolding train station to the hotel. If you arrive by bus, it stops right outside the door. If you visit our hotel for leisure with your family and/or friends, Kolding and the surrounding area offer an abundance of experiences for both children and adults. Visit the royal castle Koldinghus or go for a walk in the lovely pedestrian streets in the town centre. And of course, your family cannot miss out on a trip to the amusement park Legoland or Givskud Zoo, both within a short distance of our hotel. With us you don't need to worry about the car. We offer 200 outdoor parking spaces free of charge to our guests. Just remember to register your car in the reception. Enjoy a pleasant dinner in Restaurant Gefion, round off the evening in our bar. Hotel Scandic Kolding is the ideal meeting place for the Triangle Area (the area bounded by Kolding Fjord, Vejle Fjord and the Little Belt). Our 18 conference venues have been awarded 4 stars. They all benefit from natural daylight and are all on the ground floor.